With everything exquisitely arranged to create the perfect oasis of luxury, relaxation and tranquility, Oasis Villa 1 is ideal for a romantic getaway with your loved one. The perfect setting for honeymooners, this villa offers just about anything you might need to make your stay a memorable one. From comfortable furniture to optimal privacy, Oasis Villa 1 harmoniously blends escapism with a few homely touches, offering the type of setting that might make you never want to leave. 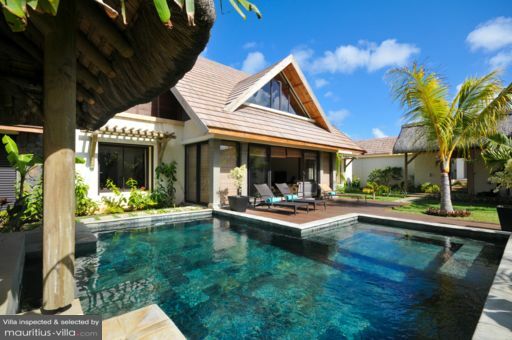 Oasis Villa 1 is equipped with an airy master bedroom with a double bed. This space is fully air-conditioned to shelter you from the island heat and create a cool cocoon of rest and relaxation. In the master bedroom, you will also find a dressing as well as a safe where you can stow your valuables during the duration of your holiday. This room also leads to the master bathroom which is beautifully arranged for a spa-like experience. The en-suite bathroom includes a sunk-in marble tub, shower, toilet, sink and mirror. 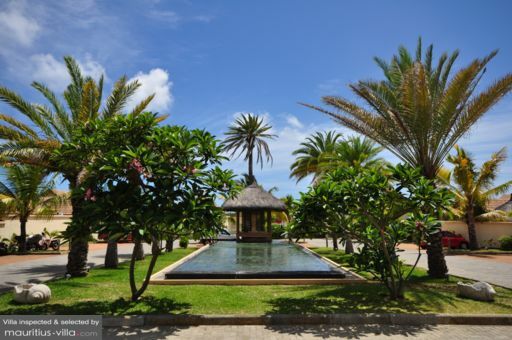 There’s no denying that Mauritian summers can be deliciously sun-kissed. If you want to absorb as much vitamin D as possible, you will be glad to learn that this villa is found right in the middle of a lush garden with emerald green greenery and the occasional burst of colour, courtesy of the generous tropical flowers. Its spacious exterior is enhanced by the impressively huge private pool of 5.4m x 5.6m, where you can cool down after a full day of visiting the island or simply work on your laps. Rest assured that the garden does come with comfortable sun beds, where you can sip leisurely on a cocktail as you savour the golden hues of the sun or immerse yourself in your favourite book as you work on the kind of tan that will undoubtedly attract envious looks back home! The garden also comes with comfortable outdoor furniture as well as barbecue facilities and equipment. A gazebo is also nestled in the midst of the abundant greenery, enabling you to dine Al-Fresco whenever the mood strikes. The airy living area is generously furnished to make it feel just like home. From a comfortable sofa to a wide-screen television, coffee table and ceiling fan, the living room is an absolute oasis of rest and tranquility. Guests can also make the most out of the dining room and fully-equipped kitchen with all the utensils you might need to prepare your favorite meals. At Oasis Villa 1, you can be sure to be pampered like never before. Indeed, as soon as you step in, you will be greeted with a refreshingly cool fruit cocktail and a platter of tropical fruits. A housemaid will come in everyday to take care of the housework. Best of all, every morning she will bring you a breakfast hamper bursting with pastries, assorted jams, coffee, tea and fruit juice. For an additional fee, you can also order sausages, bacon and eggs and the maid will gladly cook them on-site for you. Or, to take it up a notch, you can also order the services of an experienced In-House Chef who will take care of your daily meals. Other services include- but are not limited to- baby sitting, massage, excursions, shuttle bus, car rental, catering, grocery delivery, airport transfers and the likes (all at an extra cost). 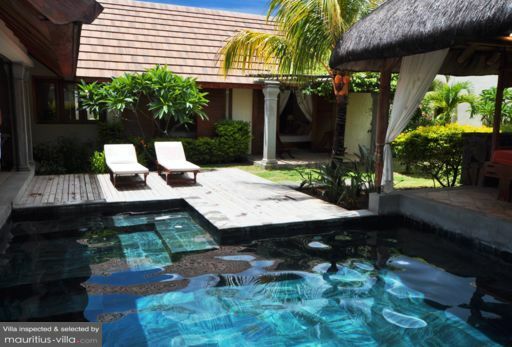 Guests of Oasis Villa 1 also have an exclusive access to La Plage, a privately owned beach where you can lounge for as long as you want as you bask in the wonderful Mauritian sun.